This is the story of a highly-trained German Shepherd who was part of an elite British Special Air Service (SAS) convoy. This dog saved an entire platoon that had been ambushed by Isis terrorists near their stronghold, the northern Iraqi city of Mosul. (See my story about Sergeant Rocky and Officer Brown.) These commandos were en-route back to their base after completing a 10-day training course with Kurdish Peshmerga soldiers when a road side bomb near the front lines struck one of their four vehicles. There was a terrifying scramble for cover as about 50 Isis militants armed with trucks mounted with machine guns encircled the platoon and fired mercilessly from three different directions. 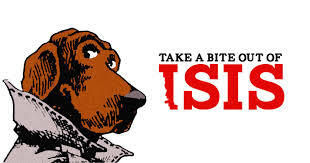 one of the brave soldiers, an American who was attached to the SAS team, unleashed his dog, who according to The Daily Star Sunday, "was with the team in a training role, but when the troops came under fire, was desperate to get involved. When the dog was unleashed, it went after the greatest threat without consideration for its own safety– this is what they are trained to do." (See Lucca: A Military Dog For all Seasons). And what a job this courageous service dog did on two terrorists! The animal transformed into a deadly, enraged furry projectile with sharp teeth and despite being shot at several times, attacked with all the fury of a wounded tiger. One man lost most of his face to some very patriotic and nasty bites; another left the scene screaming for his mommy with a mangled bloody arm that would never hold another gun. Both deserted the battlefield, like rats fleeing from a sinking ship and, with the subsequent aid of US fighter jets swooping in to bomb the terrorists, the Brits were able to overpower the militants. 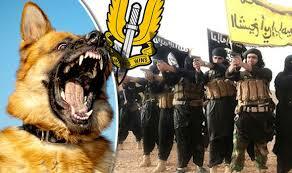 Miraculously there was no SAS loss of life, either human or canine. German Shepherds are referred to as 'Alsatians' in many European countries and they are the favored breed of the United States military because of their extreme intelligence, loyalty and ability to become very aggressive when needed. They have been used a dogs of war for many years dating back to World War One where they first demonstrated their ability to perform as military service animals. (See Bretagne; Last 9/11 Service Dog Dies). They served as ammunition carriers, guards, messengers and performed search and rescue missions. The breed was popularized by Corporal Lee Duncan, an American soldier who encountered a German Shepherd and her litter in a bombed war dog kennel in Lorraine, France in 1917 and trained one of the pups to become Rin-Tin-Tin. After the war, these service dogs became the first to guide blinded soldiers, which led to the formation of the Seeing Eye Dog. During World War II, they helped The Red Cross locate wounded soldiers. Apparently, American military might and bite not only rhyme, but are also synonymous when sprinkled with extreme danger under fire and devotion above and beyond the cal of duty. Although hailed as a hero, there has been no name released to salute as a sign of respect for this incredible dog. Risking his own life to save his fellow soldiers deserves a name all its own and somehow 'good doggie' just doesn't seem to cut it. 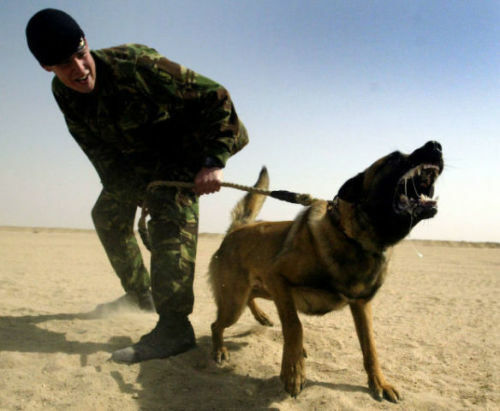 Although man's best friend does cover some of it, maybe the army can conjure another, better name that more closely reflects this dog's killer capabilities. How about Zach the Ripper? Cats Hate Water? I Think Not! The Animal Video Of The Day!!! The Bird Eating Spider -- The "Egad!" Animal Video Of The Day!! !